Even though Rapunzel’s tale has been around since the 1800s, she is fairly new to the Disney princess family. She joined in 2010 with her film “Tangled” and is the 50th animated feature in the Walt Disney Animated Classics series. It is loosely based on the German fairy tale “Rapunzel” in the collection of folk tales published by the Brothers Grimm. 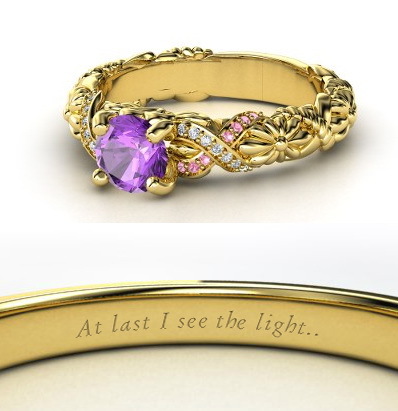 You can’t remember Rapunzel without thinking about her long, golden hair, and this ring recreates this image perfectly. Flowing down from the center stone are smaller diamonds and pink tourmaline as if to beg a prince to climb up. Blooming flowers and braided vines of yellow gold run through with diamonds and pink tourmaline accenting this ring while a large, brilliant amethyst takes center stage. I also love how the flowers are placed inside her hair along the band. Disney’s Pocahontas was created right in the middle of the 10 year period between 1989 and 1999 known as the Disney Renaissance. I vividly remember anxiously sitting in the movie theater with my parents as we waited for the lights to dim, and the projector to start…well, projecting. I instantly fell in love with her adventurous spirit, and of course, the gorgeous music! 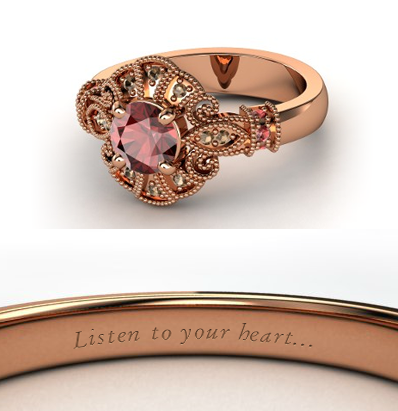 I really love how the red garnet and rose gold throughout this ring really captures Pocahontas’ fiery spirit and bold heart. 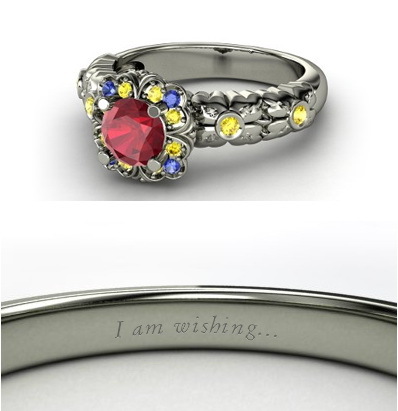 And at a price of around $1,000, it’s one of the thriftiest buys around for a Disney Princess Engagement Ring!